IDW and multiple Bram Stoker award-winning author, Jonathan Maberry bring the untold stories from the zombie post-apocalyptic world of Rot & Ruin to comic books this September. This all-new series is set in a world fifteen years after the dead have risen and vastly outnumber the survivors of the zombie-apocalypse. In the aftermath, humanity has found a way to live a marginal existence by forming fenced-in towns where everyone has a job to do in order to survive. 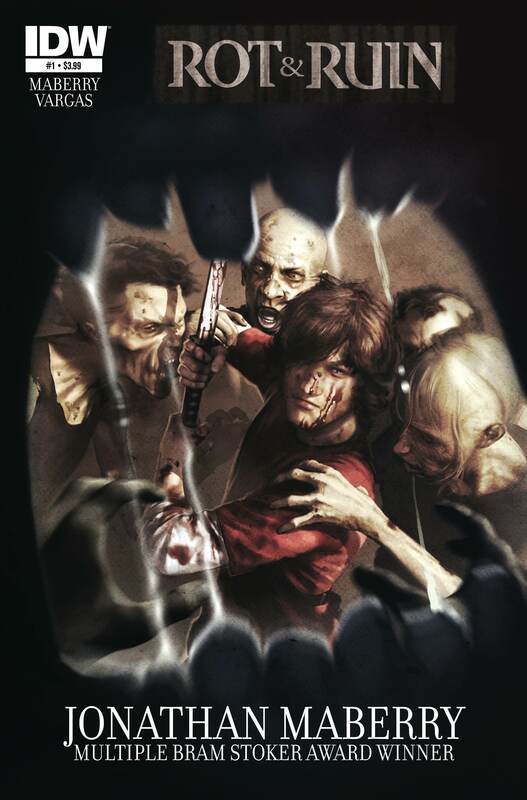 As in the award-winning novels, the comic series will center on Benny Imura and his friends as they make their way in a world where the zombies aren’t always the greatest danger. The ongoing Rot & Ruin comic book series will follow Benny, Nix, Lilah and Chong as they head east in their journey to find what they thought was impossible, a jumbo jet. In their travels they will encounter countless new dangers that will force them to confront what they and others are willing to do in order to bring humanity back to its former glory. Maberry’s Rot & Ruin bestselling novels have been winning library and school awards all over the country as heartfelt action books that encourage teens to read. The series is now in development for film. Rot & Ruin will come alive with the help of artist Tony Vargas (Temple Run) and colorist Oliver Lee Acre, with stunning covers by Alex Ronald (Vampire Vixens, Judge Dredd).